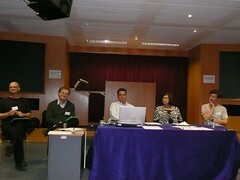 We have now gathered together the presentations from the conference and audio recordings for many of the sessions. These are available through the conference support site from the programme for each day. Yes it is nice to have the conference over – but it is also great to find out even more about the presentations I missed by reading these blog entries. Thank you very much to those who have blogged here (and elsewhere – pipes might be letting us down but technorati and flickr can now kick in). Thanks in particular to the core blogging team of Gill, Anesa and Rebecca and the extra blogs and pictures from Ale, Andreia, Steve, Andreas and Alex. Robin: Implications of the OER is quite vast in particular at the OU, where content has always been highly prized, then the role of the tutor in the OU becomes vague and it needs to be rethought about. Some people at the OU are quite wedded to their content and can’t see themselves without it. She is seeing scope for having institutions for accreditation etc. but she doesn’t see it happening … because there have been lots of technology new dawns (cites the examples of tv showing the best lecture) – and this never happened. She thinks that OER should become part of our scholarly activity. Libraries have been around for 150 years and it has not dented university roles – content is not everything … content is NOT king, whoever said it was king … it is so ISN’T. OER is just a modern version of a library – the OU has gone a bit further by providing tools – we therefore need some more support … gives an example of some guy who learned and became an expert on Turkish carpets through reading books. Talks about some other guy who failed to get into medical school in because he didn’t know Botecelli (?) painted the Venus. John (?American guy ? ): Talks about the OU degrees being accepted as being perfectly accepted degrees here in the UK. His job is to be the director of the OpenContent Consortium at MIT. He is wondering if people putting up more course materials up would make any significant difference. Mentions creative commons, wikiversity etc – things he picked up from the last 2 years. He is thinking we have the raw materials (nails, hammer and board) but we’re not sure what we’re building or rather to what end are we doing this for. He is thinking that we should consider how all how individual little projects fall into the grander scheme. He is thinking at some point we should get something call a “Open degree” but this does not replace the formal education … He likes the idea of that big goal, although it is controversial and may cause fear in people’s hearts. Terry (American? Canadian? ): We are not culturally equipped for rapid change … there is a crisis coming into higher education as the entry class is declining whilst life-long learning is increasing … the reason we have been doing so well, is because the university people have connections in the elite and the cabinets .. and he thinks until there is a cultural crisis there isn’t going to be any change to use these in any big way … Athabasca is planning to start accreditation these courses and have applied to the Hewlett foundation to do this. What are we assessing and how do we assess? Especially with the plagiarism issues and especially with the life-long issues. Andrew: We are in a state of crisis … and what is going to follow on … he cannot separate digital revolution with the OER. With the context of this, he winces when he hear contents too much. He would like a change in educational practices, new epistemology … He is saying phase 1 has been the technology as we’ve developed enough content to last out a life time … and should enter phase 2 (not sure what this is) … he is thinking we should look at tools instead … in particular use and reuse of tools. If things are going to be used it should address a problem or do something interesting and we’ve been commodifying things. We need to form social relationships and do interesting things together – and we can have a bigger landscape in which to do these things as we become more fluent in these digital technologies. If we stop being in those old-fashion models then things become more interesting and fun. Simon: Is saying that academics don’t creative content but rather narrative as everything they do is free and is out there … if that is what academics have always done then people will continue to do that as people are lazy. Andrew: He thinks it is absolutely true but cannot be change, becoming competent in these new digital literacies is not going to happen in a one-day training course but being committed to engaging with it. Mentions Imagine a programme on BBC that shows web 2.0 stuff – asks if anyone watches it – as it turns out nobody does. Denise: What does the panel think about heading up a mix-and-match university of the future? How can you accredit me in some way when we do taster courses? Terry: Athabasca has been doing that with $100 to challenge the exams and something etc. He is saying that his students would do things for marks but wouldn’t do things without the incentive marks. He is saying he doesn’t agree with Simon, as he thinks the narrative can be spun by other students and other people in general. Erik: He doesn’t agree with the marking thing – the only reason why the students are so focused on marking is because they show up after 12 years of being conditioned to marking and also most of the things we teach have no relationship to their lives so unless we have the marks they won’t care about it. He mentions his 85 yr old father who goes to classes to enjoy it (makes a joke – which we heartily laugh at – that his father alone raises the average age of the class). UNICEF guy (Mike?) – He is referring back to John’s speech. He’s talking about a book “White man’s burning” (?) – he is saying he works at the UN and he knows that big ideas don’t work. He is saying historically that it mightn’t work. He is saying let’s use the survival of the fitness format, in that if we continue in the small projects that we do, then the best one will eventually succeed. He is saying that the content we need is probably no longer quantitative but qualitative since in the 3rd world country that the content is quite archaic. He is thinking that this will be a great thing for the African continent. There is a real hunger for knowledge by the young people – so more knowledge available – all the better. Robin: Is giving an example about Nepal that money was given to build a library but no money for books. And she now understands why they use an instructivist approach but it is because they don’t have the resources and hence everything has to come from the teacher. Some guy: How does OER links to research? Robin: Is talking about an European project which she has funding for in writing course materials and checking to see how easy they’re able to write them … talking about a participant in her project said that it might be easier to start from scratch rather than reuse materials. Erik: Saying there is a lot of irrelevant research occurring as well as in teaching … and by making things more transparent or in a metadata style then it can become better. Terry: I think there is a huge opportunity for research … (but there is little funding for it in comparison to health research) but does thinks it is a good idea. Andrew: Thinks are changing quickly so we need to ask the right research questions and be quite agile in the way we do things so it can feed into it quickly … so we have to change our research methods. John: He is commented on big ideas being impossible (UNICEF guy) – and he is saying call me an idealist (?) but he just look at Google and Wikipedia they’ve done well, but he takes the point that most big ideas fail … but that we shouldn’t lose the spark that a big idea might just break through. And that we can have a lot of fun doing it. Andrew: Is saying that lots of things weren’t considered as a big idea such as the internet. UNICEF guy: Says that one thing we’re missing that the biggest motivator was profit (in reference to Google) whilst we don’t have that in the OER. Talking about the SLOOP project which is part of the Leornado da Vinci programme and it is an European project. It aims to promote a community of teachers whose main interest is the production of learning materials (?) in a collaborative way to be digital educational resources (i.e. searchable, customizable, interoperable and something else). They wanted to use SCORM (I think) for their standards to have educational resources that were easy and also be reusable, searchable, adaptable and interoperable. There is a problem of contextualized Los and makes it impossible to be used in a constructivist model (but do we actually want this?) and the technical standards makes it difficult for teachers to develop their own educational resources. They need to move to an Open Learning Object (OpenLO) in particular when thinking of reusability issues – he is not interested in a black-box LO but something in which they can change inside (so my black-box research even turns up here!). He is saying that the OpenLO life cycle should change from the traditional water-fall model to a more agile model where agile practices should be applied at all levels …. 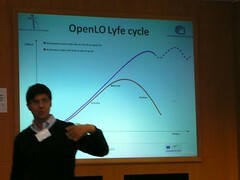 He is showing us a graph of the OpenLO life cycle now … where the blue line shows it going steadily upwards which is theoretical and a red line showing it actually having a decline. There has to be a learning object management system (FreeLOMS – http://www.freeloms.org) – and this should provide an environment to share resources and they should provide the tools to support collaborative activities. Should also permit the development of learning resources following an open licence (e.g. creative commons). He is saying that the LOMS should not replace the LMS/VLE, the teacher just has to learn different tools but the LOMS should provide an easy mechanism for integration with the LMS. He’s talking about the way they have converted the materials into metadata … guess Erik Duval would be glad about this! Their specified metadata is based on a 3-level model from IEEE LOM. They’ve made a one click function for ppt files as the teachers have most of their files in that format and weren’t too concerned about pdf files. They’ve also included RSS into the FreeLOMs (I always like RSS feeds … great stuff) and they’ve also able to have direct access from Moodle to FreeLoms (well not quite – still has to be released – but wonder how that actually works). The Sloop site is in several languages, they have 436 students from around the world (is that a lot? Not sure …). He agrees with Erik that all materials on the web should be free of use for educational purposes … gave an example of some professor who was fined $6000 because he uploaded pictures (probably painting?) of Monet rather than Picasso. Now he is moving onto Learning Objects in the Web 2.0. (Don’t think I’ve done justice to this post as I think my brain is heading to shut down … even the boost of a chocolate biscuit at tea-time didn’t seem to help … maybe should have two instead :D). Right question time and he has a quote by Walt Disney … “Our heritage and ideals, our codes and standard – the things we live by and teach our children – are preserved or diminished by how freely we exchange ideas and feelings”. Chris was busy reading the Walt Disney quote and forgot to stand up and say question time :). Question: Can you easily integrate this system into blackboards? Giovanni: Yes, but he is not sure that is the right way – the way to go is to try and integrate them with different platforms and freeLOMS is an opensource software so there isn’t much support for integration.